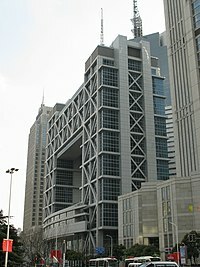 The Shanghai Stock Exchange (SSE) (simplified Chinese: 上海证券交易所; traditional Chinese: 上海證券交易所; pinyin: Shànghǎi Zhèngquàn Jiāoyìsuǒ), abbreviated as 上证所/上證所 or 上交所, is a stock exchange that is based in the city of Shanghai, China. It is one of the two stock exchanges operating independently in the People’s Republic of China, the other is the Shenzhen Stock Exchange. Shanghai Stock Exchange is the world’s 5th largest stock market by market capitalization at US$2.3 trillion as of Dec 2011. Unlike the Hong Kong Stock Exchange, the Shanghai Stock Exchange is still not entirely open to foreign investors  due to tight capital account controls exercised by the Chinese mainlandauthorities. The current exchange was re-established on November 26, 1990 and was in operation on December 19 of the same year. It is a non-profit organization directly administered by the China Securities Regulatory Commission (CSRC). The formation of the International Settlement (foreign concession areas) in Shanghai was the result of the Treaty of Nanking of 1842 (which ended the First Opium War) and subsequent agreements between the Chinese and foreign governments were crucial to the development of foreign trade in China and of the foreign community in Shanghai. The market for securities trading in Shanghai begins in the late 1860s. The first shares list appeared in June 1866 and by then Shanghai’s International Settlement had developed the conditions conducive to the emergence of a share market: several banks, a legal framework for joint-stock companies, and an interest in diversification among the established trading houses (although the trading houses themselves remained partnerships). In 1891 during the boom in mining shares, foreign businessmen founded the “Shanghai Sharebrokers’ Association” headquartered in Shanghai as China’s first stock exchange. In 1904 the Association applied for registration in Hong Kong under the provision of the Companies ordinance and was renamed as the “Shanghai Stock Exchange”. The supply of securities came primarily from local companies. In the early days, banks dominated private shares but, by 1880, only the Hong Kong and Shanghai local banks remained. Later in 1920 and 1921, “Shanghai Securities & Commodities Exchange” and “Shanghai Chinese Merchant Exchange” started operation respectively. An amalgamation eventually took place in 1929, and the combined markets operated thereafter as the “Shanghai Stock Exchange”. Shipping, insurance, and docks persisted to 1940 but were overshadowed by industrial shares after theTreaty of Shimonoseki of 1895, which permitted Japan, and by extension other nations which had treaties with China, to establish factories in Shanghai and other treaty ports. Rubber plantations became the staple of stock trading beginning in the second decade of the 20th century. By the 1930s, Shanghai had emerged as the financial center of the Far East, where both Chinese and foreign investors could trade stocks, debentures, government bonds, and futures. The operation of Shanghai Stock Exchange came to an abrupt halt after Japanese troops occupied the Shanghai International Settlement on December 8, 1941. In 1946, Shanghai Stock Exchange resumed its operations before closing again 3 years later in 1949, after the Communist revolution took place. After the Cultural Revolution ended and Deng Xiaoping rose to power, China was re-opened to the outside world in 1978. During the 1980s, China’s securities market evolved in tandem with the country’s economic reform and opening up and the development of socialist market economy. On 26 November 1990, Shanghai Stock Exchange was re-established and operations began a few weeks later on 19 December.